An axial fan is a device that creates airflow by using a motor to rotate an impeller housed within a frame. The circulating blades draw air into the fan and expel on the same parallel axis as the spinning shaft. Hence the name axial fan. What does an axial fan do? The primary function of the axial fan is to cool. Fans work by drawing air across a surface to cool it. Fans are also excellent at moving large volumes of hot or warm air away, also creating a cooling effect. Why do we need axial fans? Axial fans are a vital component ensuring the smooth operation of machinery and electronic equipment. Keeping equipment cool is essential as overheating often leads to serious complications including premature deterioration of parts, shorter life spans and sometimes, complete failure. What axial fan is best for me? Supply voltage - Does the fan need to be AC or DC operation? Fan speed - High or low speed? What rpm is required? Noise level - Does the application require a silent fan? Static Pressure - What is the resistance to airflow? 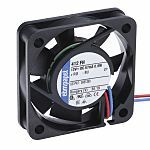 Ingress protection - Does the axial fan need to be IP55 rated or above? Bearing type - Sleeve or ball bearing? Air-flow - What volume of air is needed to cool the area? Shape - Square flanged or circular? Electrical cabinets and enclosures - Axial fans are installed to keep components cool preventing premature failure. Server racks - Silent axial fans are used to keep expensive equipment like hubs, routers and patch panels cool. Production Lines - Areas where motors are constantly in use, prolonging motor and gearbox life. PCs and laptops - Compact computer fans are used in PC desktop towers and to keep internal components cool in laptops. 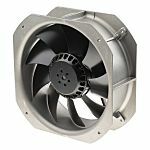 Ventilation - Axial fans are also used to remove large volumes of warm air from an enclosed area to keep temperatures stabilized.